I suffer from advanced multiple sclerosis and I cannot walk or stand unaided. I use a variable height saddle stool, it makes my life so much easier. Now I can easily move around in the kitchen. What a change it has made to my life. Now I can move around in the kitchen doing jobs that I enjoy. These had become very difficult because I cannot stand up for more than a few minutes. The stool is like a horse’s saddle on wheels or you could call it a Tilting Saddle Stool with Short Seat. You could even say its wheely great :-). I was finding it impossible to stand upright and prepare food in the kitchen, blame the MS. I was getting tired and running out of energy. Half way through cooking a meal I would have to sit down and rest. Now I can prepare a meal and cook it without taking a break to rest my weary feet. In case you had not guessed cooking is something that I really enjoy doing. Cooking was turning into an impossible task. Now with the saddle stool I can swoop around in the kitchen. The stool ticks so many boxes. I can easily vary the height of the stool as well as the angle of the seat and it is very stable. Uisng the stool I can get saucepans out of cupboards and food out of the fridge without fear of falling over. Moving around the kitchen is now exercise. Balance is essential to sit on the stool so it will strengthen my core muscles. Another advantage, I can raise the seat so now I can be at the same height as other people when I talk to them without standing on my feet. When cooking or preparing food I would bend at the waist and knees. It looked and felt very unnatural. All of this is an MS problem. I don’t know how many times The Wife would bark out ‘Stand upright!’. I would but seconds later and I was back in the slouch position. My body would morph into this very unnatural position and there was nothing I could do. I would try and push my waist against a work surface but suddenly I would be drooping again. Worst of all, my back hurt. Cooking in the kitchen has been given back to me buy using the saddle stool. I walk unsteadily because my legs are weak. The saddle stool has given me back a part of my life that I thought I had lost for ever. I have foot-drop and very bad balance so I always use a walking aid such as a rollator. . Living with MS always means a compromise. The saddle stool has restored something that is very important to me, independence in the kitchen. Click HERE to look at the details on Amazon. I’m glad you’ve found this stool Patrick. I’ve had one for 7 years and it is the best aid I have. It’s brilliant for core muscles and I even took it to my husbands 60 th party where I was able to use it for dancing. I have a back on mine now but I’m sure I’d be living on ping dinners without it. The fact it goes up and down allowing me to get things in and out of freezer and cupboards and do boring things like loading the washing. A real enabler. Enjoy. I like the word enabler. The enabler now lets me do things that I enjoyed doing such as cooking. These activities were just too tiring and I had had to give them up. My daughter bought me a saddle stool for my birthday/Christmas present. Best present ever. I have the same problems standing for any length of time, even short times these days. My saddle stool has changed my life in the kitchen. I can stay seated to empty the dishwasher, cut up veggies on the side. Move items across the kitchen all by rolling across the floor. 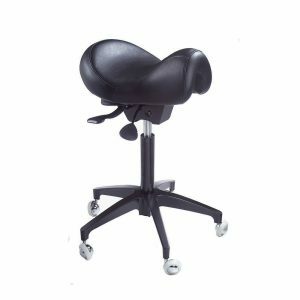 I get terrible back pain too and the saddle stool helps position your back properly relieving the pain. If you go onto the webpage from my site http://www.aid4disabled.com/saddle-stool-move-around-in-the-kitchen/ and click on the picture you will then go to the page on Amazon. I hope that helps. Incidentally if you want to spend seriousa money then look on the vela.eu website.